To correctly inspect and thermo-graph electrical switchboards and equipment, the switchboard covers or equipment covers are opened expose the electrical connections and wiring and other components. A detailed report is compiled highlighting any irregularities that are found this includes the images that were recorded during the inspection. Astra Electrical use the latest infrared thermal imaging equipment and software to ensure that the most upto date methods and procedures are employed. Infrared Thermography is used to detect potential faults, which could be minor or major faults. It is used for preventative maintenance purposes, to eliminate potential faults before they cause downtime and before they can cause damage to surrounding equipment. A scan of an electrical installation or switchboard will reveal in just a couple of seconds any abnormal temperatures generally preceding equipment failure. The Thermography report will identify the exact location of the fault, so that no time is wasted using the elimination processes to find the fault. Major cost savings are made when the procedure is used in conjunction with a regular preventative maintenance program. Unexpected breakdowns in all types of plant and equipment can be prevented long before they become apparent. Repairs and maintenance can then be scheduled as required. 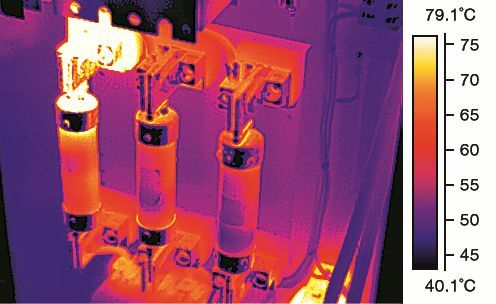 Using infrared Scanning as a diagnostic tool is a good condition monitoring technique that measures the radiant heat pattern emitted from electrical plant & equipment. This technique will determine the area or location of increased heat emissions, which indicates the presence of a fault. It can identify potential equipment or component failure or irregularities in loading of equipment. It can prevent fire or an explosion. It is used to check the integrity of components. It can determine loading condition of equipment. A visual inspection of each switchboard will help determine its general condition such as broken locks or broken door hinges, excessive heat in enclosure, excessive build up of dust or dirt, the entry of vermin into the enclosure and any unsafe condition or discoloration of electrical components. Maintenance personnel can plan and carry out the necessary repairs without the costs of a breakdown. A report containing documentary evidence of survey results, with photos are provided with each survey.